On Saturday of Memorial Day weekend, my daughter and I attended the Opening Reception for the summer exhibition, Innovators and Legends: Generations in Textiles and Fiber, at the Schweinfurth Art Center, 205 Genesee Street, Auburn. It was the perfect close to a busy day working in the yard and enjoying the start of summer here in the Finger Lakes. We are big museum lovers and often visit The Everson in Syracuse and The Johnson at Cornell University in Ithaca. Any time we go anywhere, we hit a museum or two. Lydia attended Art Camp at the Schweinfurth for years and years and can analyzed Art with the best of them. But this show – wow! – we both said we need to go back again and look and think and enjoy. Give yourself time to savor this exhibition. There are 76 pieces of art by 50 artists created by icons of the textile world like Gerhardt Knodel, Tom Lundberg, Nancy Crow, Sherri Smith and Arthuro Alonzo Sandoval who spoke eloquently about his life’s work at the Opening. His intriquely woven creations include library 35 mm microfilm and other recognizable materials – but all in new and striking combinations. Themes range from the narrative, identity exploration, ecology, recycling to political thought. The creative potential is endless. Fiber art is transformed from the functional and decorative to the innovative and experimental. Some pieces are shocking. There are tapestries, clothing, wall hangings, hooked rugs, lace, sculpture and various materials including wood, hair and metal, but all with a “spin”. All are well crafted. 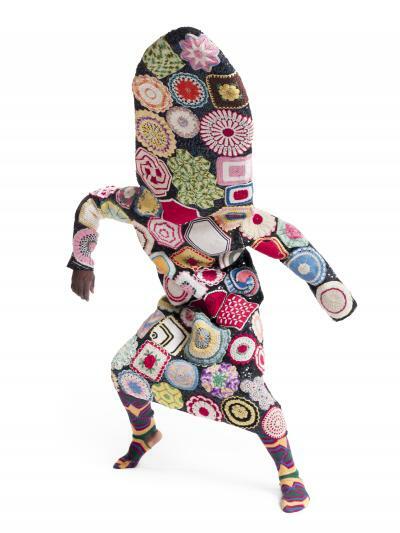 Two works by Nick Cave will catch your attention as soon as you enter the gallery space. Standing about 8 feet tall, his Sound Suit Series dominate the room. One piece is made of human hair dyed hot pink while the other, Sound Suit 2009, is fashioned from mixed media including vintage potholders. They are costumes to be worn and performed in. Innovators & Legends: Generations in Textiles and Fiber is a traveling show organized by the Muskegon Museum of Art, Michigan with guest curator, Geary Jones. This is the only opportunity to see this display on the East Coast. The show runs through August 11. Don’t miss the yarn bombing out in the front yard. The trees, sign, light poles and more have been wrapped in knitted strips. Westminster Presbyterian Church, William Street, Downtown Auburn, has also joined in the fun of yarn bombing! The Schweinfurth Art Center often exhibits textiles of various forms. Starting in July, Quilting by the Lake will be held at Onondaga Community College offering 2 weeks of classes, lectures, workshops and open studios with well-known quilters and textile artists from around the world. An invitational exhibition features works by students and faculty of QBL and runs from July 14 – 26. Quilts = Art + Quilts, an international juried quilt show now in its 32 year, runs from October 26 – January 5, 2014. There are typically 115 – 130 art quilts on display along with classes and workshops also taught by nationally and internally know quilt artists. Check out the Schweinfurth Art Center for open hours and more.